The California Office of Traffic Safety (OTS) hosted a distracted driving education event April 12 at Sacramento’s Inderkum High School as part of a larger effort to inform the public on the dangers of distracted driving. Hundreds of high school students had the opportunity to meet with traffic safety experts to learn about how they can stay safe behind the wheel and avoid distractions. They even put those distractions to the test, navigating courses while eating an ice cream cone or wearing simulator goggles to experience first-hand how distractions like cell phones affect your ability to drive safely. During the event, the OTS announced a statewide video and billboard contest for high school students to encourage their peers to not drive distracted. The contest runs through May 17 with cash prizes for each category. Details on rules and how to enter can be found here. April is National Distracted Driving Awareness Month, and the OTS is joining law enforcement and other traffic safety partners to highlight the importance of traveling free of distractions, whether in a car, on a bike or on foot. The OTS will be running a distracted driving campaign on TV and digital platforms throughout the month of April as part of our new initiative, “Go Safely, California,” which serves as an educational resource on safer ways for Californians to arrive at their destination safely. Law enforcement is conducting statewide enforcement efforts to discourage distracted driving by targeting drivers who are violating California’s cell phone law, which prohibits drivers from holding a phone or other electronic communications device. Drivers under 18 are not allowed to use a cell phone at all while operating a vehicle, including handsfree. 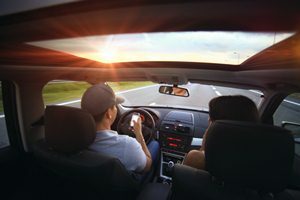 According to a 2018 public opinion survey conducted by the OTS and University of California, Berkeley, nearly half of all drivers surveyed said distracted driving because of texting or talking is their biggest safety concern on roads.